How are these shoes sized? These shoes are sized based on U.S. sizing standards. Refer to the Sizing Guide for more information on size selection. Are "slip-resistant" shoes really slip-resistant? No sole is 100% slip- and fall-proof; just because shoes are labeled "slip-resistant" doesn't mean that the wearer will never slip or fall. However, thanks to the patent pending rubber compound and specially designed tread pattern, you can count on these shoes to have the latest technology and greatly reduce the chances of employees slipping and falling. How should I properly clean these shoes? These shoes should be spot cleaned only. Shoe leather can be polished to maintain it's luster. Also, to get the most life out of these these shoes, do not put them in the washing machine or dryer. What is the difference between waterproof and water-resistant shoes? 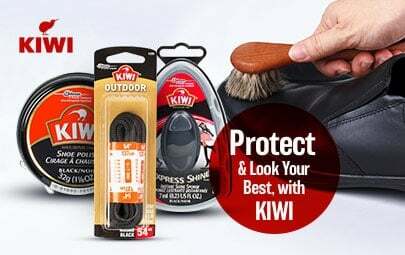 Waterproof shoes have a special membrane coating that will cause water to bead up and roll off the shoe. Water resistant shoes will not bead and eventually the material will let water into the shoe. 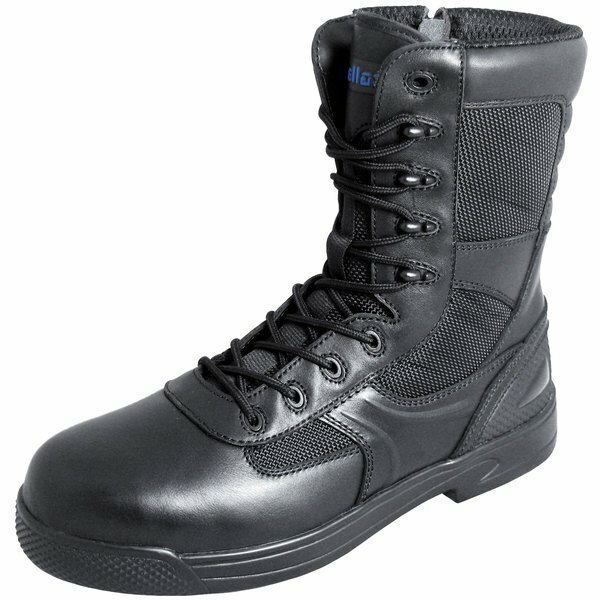 Ensure that employees look and perform their best with this pair of Genuine Grip 5080 men's black tactical boots. The perfect choice for security guards and law enforcement, these composite toe boots are designed to protect feet when there is a risk of falling objects or electrical hazards in the workplace. In addition, their non metal construction makes a great alternative to steel toe boots since they're lighter to help reduce fatigue, they won't interfere with metal detectors, and they're completely waterproof. Each pair also comes with laces for a snug fit and a zipper lock to ensure that the side zipper stays up during wear. This stylish black upper is paired with a patent pending slip-resistant rubber outsole to protect against potential slips or falls. This outsole has a square patterned tread that is ideal for walking through slippery areas. Inside the shoe, the Aegis microbe shield fights odors, stains, and deterioration to keep this shoe in service. Each pair of shoes is made with a "walking on air" polyurethane footbed ensuring these shoes will provide your staff with the comfort to stay on their feet for the entirety of their shift. This footbed provides the necessary support and comfort for long hours on the go. This support is coupled with a shock absorbing mid-sole to help protect the arch of the foot and lessen the strain caused by walking on hard floors for many hours. Falling or slipping are amongst today's leading causes of workplace injuries. Keep your workers safer with the assurance of Genuine Grip's slip-resistant footwear. Providing footwear in the industry since 1932, Genuine Grip's footwear is created with industry-leading technology including some of the best slip-resistant soles on the market.